France’s largest bank BNP Paribas has reported a sharp decline in full-year net profit for 2014, following the nearly $9 billion record settlement over US sanctions control violations. 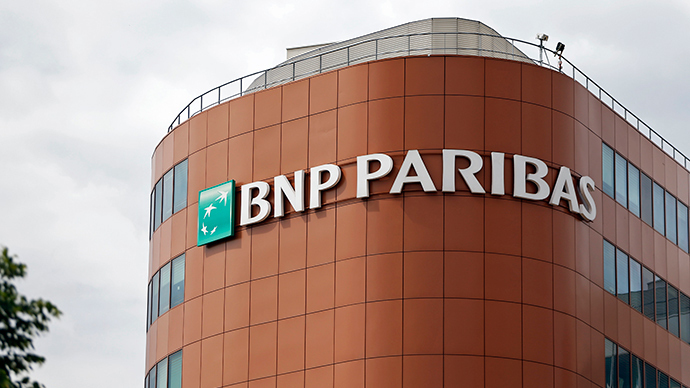 BNP’s net income dropped to €157 million in 2014 which is far below the €531 million forecast, the bank said Thursday. Last year BNP agreed to pay a record $8.8 billion for violating US sanction controls on Sudan, Iran and Cuba between 2002 and 2012. The bank’s outlook for 2016 isn’t positive as tougher international regulators, increased taxation in Europe and more strict capital rules will impact earnings next year by about €500 million. The Paris-based lender, along with other European banks, is suffering from record low interest rates, weak loan demand and the eurozone’s stagnating economy. At the same time, fourth-quarter net profit jumped. BNP announced its net profit rose to €1.3 billion in the three months through December, compared to €110 million a year earlier. BNP’s Chief Financial Officer Lars Machenil says the bank is facing a lot of challenges, CNBC reports. "However, if you look at what is in store for 2015 you see some headwinds, you see some tailwinds, you see low interest rates, you see GDP which is a bit lackluster so far in Europe,” he said. "But on the other hand you have the oil price which is very low, the euro which is very low, and you see the ECB trying some of its tools in order to address the situation...so some might see a glimmer of hope but we'll have to see how it unfolds,” Machenil added.